Papuan political prisoner Filep Karma, in prison for 7 years on treason charges after raising the banned Morning Star independence flag, has been referred to Cikini hospital in Jakarta for three months to undergo medical treatment. However he must undergo treatment in Jakarta, because Dock 2 hospital in Jayapura lacks colonoscopy equipment to diagnose the condition of Filep Karma. Healthcare in Papua is poorly funded and supplied, if at all, and health workers are rarely paid properly. Hospitalised in Jayapura’s Dok 2 hospital since 2008, FIlep Karma has been gaoled in atrocious conditions and subjected to early routine torture by Indonesian security forces and prison officers, including beatings causing internal injuries. His health has been declining since 2008 due to numerous hunger strikes and illness caused by prison conditions in Abepura prison. Karma has been complaining of a lump in his gut over the last 3 years. Since an operation was performed on 2 November 2011, Karma has continued to pass significant blood in his stools. Karma has been referred by the Dok 2 Head of Trauma to the Department of Surgery Specialist, Dr D. Arnold, Sp.B (K) BD, in Cikini. Filep had already been undergoing treatment in Jakarta separately for his prostrate. On 13 April 2012, Dr Hidayathu Samawi, the general practitioner in Abepura prison, called Karma to his rooms. Dr Hidayathu said that Karma must provide a letter of permission from the family to consent to the treatment of Jakarta, and the Letter to commit the family to bear the full cost of treatment and transport to Jakarta. 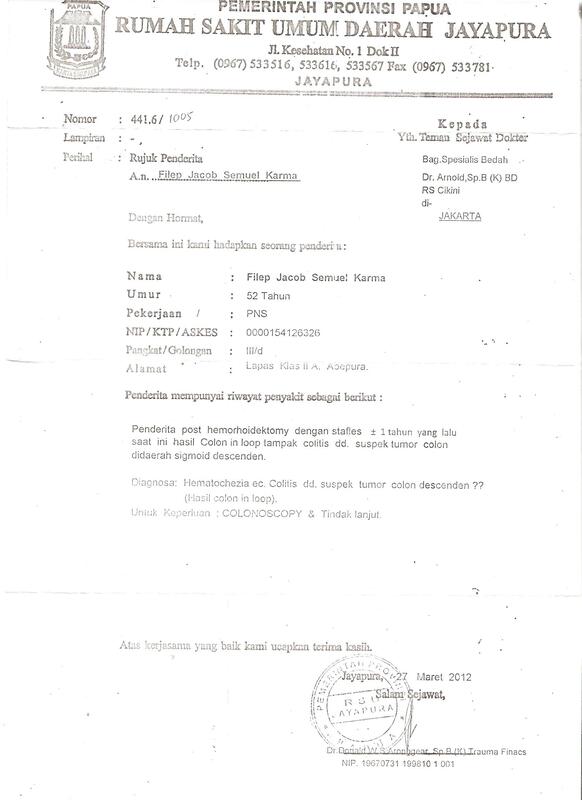 Karma in this case ask for the Abepura Prison to issue a letter that the prisons are not able to bear the cost of treatment in Jakarta, but Dr. Hidayathu said that the prison would not certify its refusal to bear the cost of treatment in Jakarta. During prison visiting hours at Abepura, Filep Karma told West Papua Media’s correspondent, “I was detained by the State of Indonesia, for 15 years, why are they unable to bear the cost of my treatment in Jakarta. My case in July 2010, it was the same, treatment not covered by the State. Abepura prison officials alone cannot issue a statement that they can’t afford the cost to Jakarta, yet I hardly have the foundation (strength) to have resort to outside solidarity as my only choice to help me for medical expenses to Jakarta,” said Karma. The Indonesian government has an obligation to provide adequate healthcare to political prisoners. According to Amnesty International, under Indonesian Government Regulation No. 32/1999 on Terms and Procedures on the Implementation of Prisoners’ Rights in Prisons, all medical costs for treatment of a prisoner at a hospital must be borne by the state, also in accordance with the UN Body of Principles for the Protection of All Persons under Any Form of Detention or Imprisonment (Principle 24) . In late February, in response to a petition filed by Freedom Now, the United Nations Working Group on Arbitrary Detention issued its opinion that the Government of Indonesia is in violation of international law by detaining Filep Karma. Amongst many other international voices, the Working Group called on the Government of Indonesia to immediately release the human rights advocate. In Nabire, Papua, there are gas stations owned by active Police officers, and rumours are circulating that security forces are manipulating subsidized fuel stocks in Papua. While in Papua Police officers own gas stations, elsewhere Police officers are seizing fuel belonging to civilians. Take for example the case in Tuban, East Java: on March 22, 17 drums of diesel fuel were found by police during sweeping raids to counter fuel hoarding in anticipation of the Indonesian government’s increases to fuel prices which come into effect April 1 2012. Besides this, Police Inspector-General Saud Usman Nasution, Division Head/Community Relations, also stated that there have been no fewer than 266 charges laid in 232 cases of fuel hoarding in Kalimantan, with a further 11 cases still under investigation. If Police are empowered to seize people’s fuel, then who can tackle the Police’s control of fuel stocks in Papua? Meanwhile though the price of fuel has yet to increase officially, in Papua and especially in the areas of the interior, fuel prices have already skyrocketed up to Rp. 20 000-30 000 ($2.15-3.25 USD) per litre, leaving one to wonder: just how high will prices rise after April 1? To oppose the program of the SBY (Susilo Bambang Yudhoyono)-Boediono government to raise fuel prices from Rp. 5000 to 6500 ($0.55 to $0.70 USD), mass protests have spread throughout Indonesia. With students and workers leading the way, it is not simply party cadres demonstrating, but even housewives are taking to the streets and refusing to accept the government’s policy. Regrettably, at the time of these massive demonstrations, President SBY, who was selected by the Indonesian people, has not even been present in Indonesia. Will the President answer the demands of the people, meet with them and comment on their aspirations? Until now no such word has been uttered by the President. Many parties judge fuel prices increase to be unrelated to world fuel price fluctuations but rather intended simply to increase net revenues, as suggested by Hendrawan Supratikno, member of Committee 5 of the People’s Legislative Assembly (DPR), Tuesday March 27. Of course, the increase to fuel prices is felt directly by the people, such that a coalition of Papuan students from different Universities in Jayapura have demonstrated in front of the Papua People’s Legislative Assembly (DPRP), Tuesday March 27. Alas, the government seems unwilling to alter its fuel increase policy even facing masses of thousands organizing actions all over Indonesia. Still, the efforts to pressure the Indonesian government continue. These actions have brought victims: the protest in Jakarta left 15 people injured after a clash with police at Gambir, Central Jakarta; the victims were taken to Cipto Mangunkusumo Hospital (RSCM). Besides this, in Makassar as well, Metro TV has reported on the beating of a student by Police. The student’s condition is of course cause for serious concern. Meanwhile, President SBY continues to sojourn overseas. To counter the mass demonstrations, SBY has deployed thousands of Military (TNI) troops as well as fully armed Police units. Not only this, but Interior Minister Gamawan Fauzi asserted that if the legislation confirming the fuel price increase is made law then local and regional officials known to participate in protest actions will be fired. The increasing authoritarian and undemocratic character of the State is becoming more visible, as laws guaranteeing freedom of public expression are being pushed aside. The Interior Minister’s pressure has not succeeded in reducing the number of state officials joining in voicing the people’s aspirations. In East Java, Mayor of Surabaya Bambang Dwi Hartono, who is also a cadre of PDI-P (Indonesian Democratic Party – Struggle Faction), joined the protests rejecting the President’s policy. Responding to the grave threat from the Interior Minister towards the Mayor of Surabaya, Bambang Dwi Hartono stated that he was chosen by the people of East Java therefore the Minister may go ahead and fire him. The Mayor’s weighty decision is an example worthy of emulation: putting one’s position on the line for the good of many. Unconfirmed reports are circulating that three foreigners have been arrested by Indonesian police in the west coast town of Fak-fak, West Papua, for taking photographs at a demonstration on MArch 19. 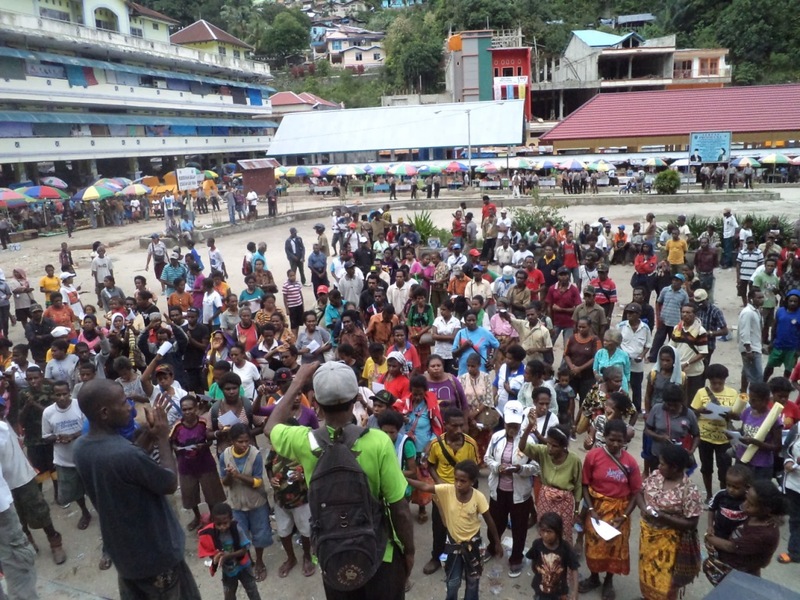 The rallies, which were held across West Papua and Indonesia, were calling on United Nations Secretary general Ban ki-Moon to advocate for West Papua and pressure Indonesia to end human rights abuses in West Papua. The UNSG was visiting Jakarta to speak at a Defence Policy expo and hold bilateral meetings with General Susilo Bambang Yudhoyono, the President of Indonesia. The three men, identified as two British and one Canadian citizens, were taken by police to be interrogated after they were observed by intelligence officers taking photographs at the rally on Monday. 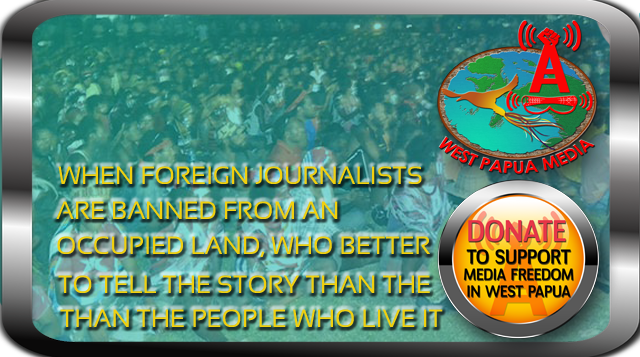 According to local sources, local police have claimed that the arrested men did not have a permit to enter West Papua, are “part of a foreign interference”. Foreigners must apply for a Surat Jalan (travel permit) to visit West Papua, and must report to a local police station or military post either daily or weekly. Foreign journalists and human rights observers are banned by Jakarta from entering the Indonesian colony. Due to this restriction, any non-Indonesian foreigner with a camera is subjected to surveillance. Local police in Fak-Fak have not been available for comment. There’s been a terror threat in Jakarta. A group of hardliners claim they intend to bomb the city’s transport system, just days before the UK prime minister is scheduled to arrive for a state visit. Indonesia’s counter terror agencies scramble to respond to the critical incident as the population goes into lockdown. I’m sitting in the Control Room at the Jakarta Centre for Law Enforcement Co-operation (JCLEC) alongside international police trainers Bob Milton and David Gray. On the screens in front of us, Indonesian police are acting out roles in this imagined terrorism scenario — and Milton and Gray are the puppet-masters. “Basically the scenario develops into a more and more complicated problem,” explains Milton, a former Metropolitan Police commander from the UK. Fake terror scenarios like this one are a regular part of the immersive training that goes on at the Australian-funded police training centre. JCLEC was set up in 2004 as a result of a bilateral agreement between Indonesia and Australia to strengthen Indonesia’s counter-terror effort in the wake of the Bali Bombings. I visited the centre last week as part of an investigation into Australia’s funding and training of Indonesia’s crack anti-terror squad, Detachment 88 — the unit responsible for capturing or killing most of Indonesia’s terrorism kingpins since the 2002 Bali attack. Detachment 88 employs a controversial brand of policing in which suspects are shot dead rather than arrested — like a soldier would shoot an enemy combatant. The high profile counter-terror raid in Bali last Sunday, in which five suspected terrorists were killed and the police were hailed internationally as heroes, was just the latest in a long line of lethal operations. The unit is funded and trained by Australia and while the Australian Government might not endorse their paramilitary-style tactics, it’s been willing to turn a blind eye because Detachment 88 has been extremely effective at disrupting Indonesia’s extensive terror network. JCLEC itself is deep within the grounds of the Indonesian National Police Academy, in the city of Semarang in Central Java. When I arrive at the centre I’m met by AFP federal agent Brian Thomson, a friendly, middle-aged cop from Canberra who is nine months into a two-year stint here. I’m the first Australian journalist he has hosted in that time. JCLEC is touted as an international police training centre but in fact its students are over 90 per cent Indonesian — 9 per cent of whom are Detachment 88. The centre hosts trainers from Indonesia and across the globe, predominantly from Australia, Europe, and the UK. Its core funding for more than 130 staff on six hectares of well maintained grounds comes directly from the Australian Federal Police’s own budget. The self-contained centre — complete with student accommodation, lap pool and gym — couldn’t stand in greater contrast to stories that abound in Jakarta about Detachment 88’s operations. JCLEC’s shtick is about “learning and understanding through shared experience” — and teaching best practice terror investigation techniques and proper use of the judicial process. Detachment 88, an elite and highly skilled unit with unique powers of surveillance in Indonesia, seems to operate above the law. As I reported earlier this month, there is growing evidence to suggest what was once solely a counter-terror unit is now moving into counter-separatist operations. Activists in West Papua claim the squad is being deployed to hunt down civilians aligned with the independence movement in a growing campaign of intimidation. According to Eric Sonindemi, a participant in last October’s Third Papuan People’s Congress, says Detachment 88 personnel were involved in the deadly attack on Congress in which six people were killed and many others wounded. “Most of the security forces were in plain clothes, but they weren’t really concealing their weapons — they were sort of showing off,” Sonindemi told me when I met with him in Jakarta. “Detachment 88 was there,” he said, explaining that he “saw their equipment and riot shields”. So exactly how closely does Australia work with the deadly unit? But a diplomatic source in Jakarta confirmed that the relationship remains extremely close — and that the AFP continues to work with the Indonesian National Police, of which Detachment 88 is a part, at head office in Jakarta. Details on our financial support for the unit are harder to come by. The Australian government committed $36.8 million over the first four years of JCLEC. Now Thomson tells me the Australia’s support for JCLEC comes out of the AFP budget, which continues to provide “roughly the same amount” of funding to the centre. We also assist the unit directly — although just what that assistance entails is a closely guarded secret. “I’ve pursued that question through senate estimates, through questions on notice, I’ve had DFAT briefings, and I can’t get any clarity about the role of Australian support of the Indonesian military and police and specifically whether our contribution benefits Detachment 88,” Greens senator and spokesperson on West Papua Richard Di Natale told NM. Details from the Indonesian side are just as shady. Although some of Detachment 88’s terror raids have been simulcast on television in Indonesia, scratch below the surface and it’s difficult to get any real detail on the unit, says Usman Hamid, advisor to the International Center for Transitional Justice. “The accountability of Detachment 88 is very low,” Hamid tells me when I meet him in a hotel lobby in Jakarta where he is meeting with other experts to prepare a response to the draft national security bill. As Brian Thomson walks me through the official JCLEC Power Point presentation, I ask how Australia can be sure that the training taught at the centre is also being “used for the right purpose” — how do we know it isn’t being used to crack down on civilian dissent? He’s silent for some time before asking me to repeat the question, and then ultimately refusing to answer it — handballing to his Indonesian counterpart, Dwi Priyatno, who refers me to the Indonesian law on terrorism, and back to the public affairs branch of the Indonesian police. I also ask specifically about separatism in Indonesia and whether techniques to quash independence movements are ever discussed at the Australian-funded centre. Thomson again gets nervous. “I can’t really answer that because my job here as an executive director is to be involved in running the centre, so what’s actually discussed in the classroom, I can’t give full [details],” he says. Back in Australia my inquiries about Detachment 88’s operations in Papua and their move toward policing separatism have been met with an almost uniform response. Here’s what I received from the AFP head office in Canberra: Australia has no mandate to tell the Indonesian Police how to run their business. And yes, we will continue to provide “capacity building assistance”. Other Papuans I met in Jakarta told similar stories — of constant surveillance by the security forces, phone tapping and intimidation. They told me that fear is part of their daily lives. Australian officials may well seek to disclaim any responsibility for the behaviour of the Indonesian police and particularly from the activities of Detachment 88. Given the close relationship between the AFP and the unit, however, it’s hard not to conclude that Australia is directly contributing to this climate of oppression. This is the second article in an NM investigation of Detachment 88 and Australia’s role in the Indonesian counter-terror effort. Read the first article here. When politicians in Australia hail the success of Indonesia’s counter-terror forces in catching, charging — and often killing — the country’s top terror operatives, it’s Detachment 88’s work they are talking about. Detachment 88 is an elite counter-terror unit within the Indonesian National Police that was formed in the aftermath of the 2002 Bali Bombings. It is funded and trained by Australia, and enjoys close co-operation with the Australian Federal Police. Noordin Top, Dulmatin, Abu Bakar Bashir, Umar Patek have all been apprehended since the force became operational in 2003. Jakarta-based terror expert Sidney Jones calls them “the top of the top” — and Australia’s training and money have been instrumental in their success in disarming Indonesia’s significant terror network. According to DFAT, Indonesian authorities have convicted over 470 terrorists and their accomplices since 2000. But there are growing concerns about what else they are using that deadly efficiency for — and although we train and fund them, we exercise little control over their operations. When Detachment 88 was accused in 2010 of torturing independence activists in the Indonesian province of Maluku, the AFP and Australian Government said they were concerned about the allegations but had “no mandate to investigate the conduct of foreign police within another country”. But the incident was not an isolated one — now, activists in West Papua claim Detachment 88 is being deployed to hunt down not only armed resistance fighters, but also civilians with ties to the independence movement, in what appears to be a growing campaign of intimidation. I met Eric Sonindemi, a participant in last October’s Third Papuan People’s Congress, in a cafe in Jakarta. He told me that soon after their arrival from Jakarta, a surge of Detachment 88 personnel was involved in the deadly attack on Congress, in which six people were killed and many others wounded. “Most of the security forces were in plain clothes, but they weren’t really concealing their weapons — they were sort of showing off,” Sonindemi told NM. “Detachment 88 was there,” he said, explaining that he “saw their equipment and riots shields”. On the last day of Congress, Sonindemi was as surprised as other participants when the police and military opened fire because the gathering had been peaceful. “Everyone thought it was going to be safe because the event ended peacefully and [Congress leader] Forkorus Yaboisembut thanked the police and Indonesia for their support. People went home thinking they were safe,” he said. But then security forces began firing indiscriminately into the dwindling crowd. “I was in a nearby monastery when the shooting started — which wasn’t until about 30-45 minutes after the Congress had ended,” Sonindemi said. Sonindemi explains that the security situation in Papua has “really been heating up” since August last year. “Before August, the police and military would not come in big numbers if there was a public rally. That has changed now,” he told New Matilda. According to Jakarta Globe journalist Nivell Rayda, who has been investigating Detachment 88, there has been a marked shift by the force in recent months toward policing “separatism” — rather than terrorism. When I spoke to Rayda last week in the Jakarta Globe newsroom he said he believes this is because Indonesia has not had a major terror attack since the second JW Marriott bombing in 2009 — and says he noticed a similar trend between 2005 and 2009, when there was also a period of relative calm. “Detachment 88 being somewhat of an elite unit, being funded and trained by foreign countries… they just lay dormant — their resources, their equipment and their tactical abilities, and investigation techniques just laying dormant for years,” he told NM. It was during this period that the unit was involved in the torture of local independence activists in Maluku. “In 2009 we had another major attack, but since then we’ve arrested nearly all the major players and terrorism suspects … there haven’t really been any major terrorism events taking shape, and it looks like the pattern seems to repeat itself: Detachment 88 has been engaging once more in non-terrorism issues, including [counter] separatism,” he said. Rayda agrees that Detachment 88 is not only pursuing armed resistance fighters, and cites a case in August last year in Nafri, Papua, in which two young girls were detained among a group of 15 people after a fatal shooting attack on a public minivan. The OPM was blamed but denied involvement and Detachment 88 was dispatched to help local police with the investigation. Nivell told New Matilda, “After Detachment 88 stepped in, they arrested 15 people — including a 7- and an 8-year-old girl. These 15 people were beaten, they were tortured, they were arbitrarily detained and treated inhumanely. Eric Sonindemi said mass arrests are a common tactic used by police in Papua to intimidate people and weed out the perpetrators. A Jakarta-based security analyst who asked not to be named admitted when I met with them last week that they held concerns about Detachment 88’s loose definition of terrorism — but claimed the force was “moving away from [policing separatism] now”. “Detachment 88 has been sent to Papua in certain cases where the local police don’t have investigative skills, but it’s more to help in the investigations than to engage in raids,” the analyst told NM. But Rayda disagrees. In fact when he asked the Indonesian National Police why Detachment 88 were involved in raids against OPM members that displaced thousands of villagers in Papua’s Paniai in December last year, he says the police were quite up front about the fact that they believe “terrorism is not only limited to bombings and militants and stuff like that. It also extends to separatism”. An Australian funded and trained elite counter-separatist force? This was not the Australian government’s intention when it began pouring millions of dollars into the Indonesian counter-terror effort after the Bali bombings. Both the 2002 MoU with Indonesia on combating international terrorism, and the MoU on police co-operation between our two countries, focus firmly on transnational, not local, crime — and the AFP says Detachment 88 has not sought assistance from Australia in any investigations or operations to counter internal separatist movements. However, the Australians do admit to working very closely with the Indonesian National Police at Jakarta headquarters, where Detachment 88 is now controlled. New Matilda asked the AFP how much they know about Detachment 88’s operations before they take place. We also asked the minister for Home Affairs, Jason Clare, whether Australia condoned a definition of terrorism that included peaceful expressions of dissent. Detachment 88 has a distinctive owl logo but Nivell Rayda say locals recognise their presence because, unlike the local police, they carry foreign-made weapons and wear balaclava-like masks. Curiously, Detachment 88 officers are commonly issued with Steyr assault rifles — an unusual rifle to be used by Indonesian forces. The Steyr is standard issue to Australian troops and is manufactured by Australian Defence Industries in Lithgow NSW. Rayda has spoken to a number of activists in Papua and Indonesia’s other trouble spots who have noticed officers from the elite unit at rallies and during raids. Sonindemi agreed when I met with him that, “The understanding that Detachment 88 are in Papua now is quite widespread”, and told me he was deeply concerned about the situation. This is the first article in an ongoing NM investigation of Detachment 88 and Australia’s role in the Indonesian counter-terror effort.